Posted by Kearsten Chapman on May 1, 2017 at 5:32 PM. Filed under LED Lighting, Around the Home, News . With over 120 color combinations, users can create lighting magic with a press of a button. Whether you’re wanting to set the mood for a special occasion, create an eye-catchingly colorful lighting display for the holidays or simply can’t decide on a single color, Enbrighten color changing cafe lights are the best choice for every season. 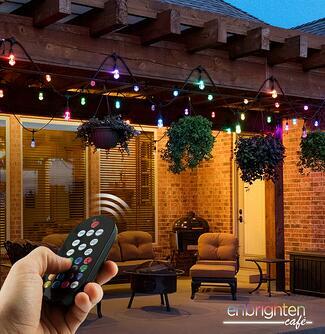 The included wireless remote can be used to not only control the LED lights but also add a range of lighting effects to create a dynamic atmosphere for every occasion. Easily take your look from a traditional vintage warm white glow to any one or two combinations of sixteen different colors. Or select from a variety of preprogrammed effects including full-range dimming, fade and strobe, and seasonal preset color modes. The carefully crafted Edison-style bulbs boast the larger vintage design and durability of the Enbrighten Vintage standard white LED models but add advanced remote controlled color changing technology. When set on year-round vintage white, the impact-resistant bulbs exude a soft, amber glow, creating an instantly warm atmosphere and guaranteed LED lighting for life.